Scholars think this scene in Hiroshige’s Tanabata Festival in a Prospering City, 1857, from the series “One Hundred Famous Views of Edo, ” may be from the artist’s own home. Famed ukiyo-e artist Utagawa Hiroshige’s last great series “One Hundred Famous Views of Edo (Meisho Edo Hyakkei),” produced in 1856-58, has long been thought to be no more than 19th-century souvenirs for visitors from provincial areas. However, some scenes in the series—such as one with a kimono drying on a nondescript veranda—hardly qualify as famous, then or now. Why did Hiroshige and his publisher Uoei highlight these seemingly unknown or anonymous places? Recent research suggests a new interpretation of the prints. The Academy is privileged to have a representative selection of prints from this series in excellent condition, which are on view in this special exhibition to celebrate the renaming of the gallery as the Robert F. Lange Foundation Gallery. The print Tanabata Festival in a Prospering City depicts a splendid view with festival decorations dancing in breeze. Although the title does not identify the place, it may in fact be a view from Hiroshige’s home. A tower seen in the distance to the right marks the Yayosu barracks of the shogunal firefighters where Hiroshige was born, raised and lived until he was 43. The warehouses depicted at the bottom of the print were owned by the merchants of Kyobashi and Minami Dennma-cho area, which was just west of Hiroshige’s residence. In the bottom right corner, the intimate scene of a kimono hanging on a veranda to dry supports the idea that the view was from Hiroshige’s window. Taking historical events into account to read the image, in the tenth month of 1855, five months before “One Hundred Famous Views of Edo” was published, the Great Earthquake of the Ansei era shook Edo, killing an estimated 9,000 people and damaging a vast area of the city. 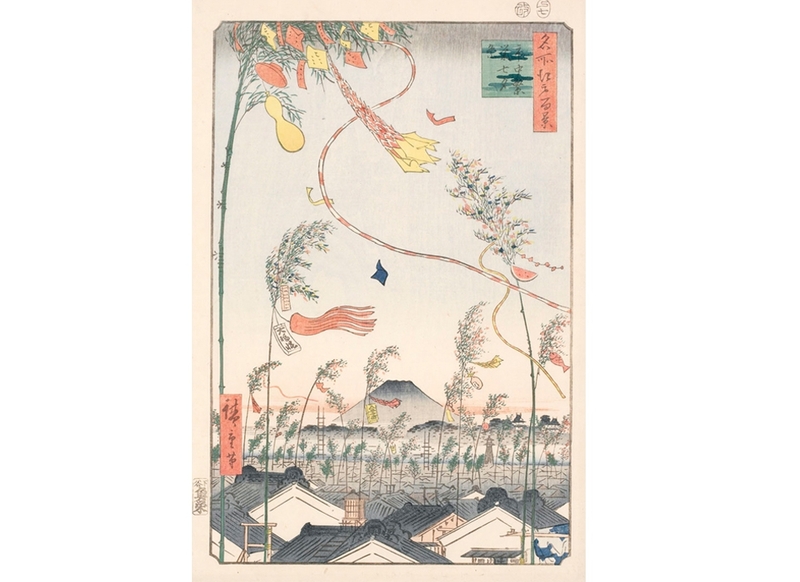 Hiroshige, whose neighborhood was severely damaged by fires caused by the earthquake, may have intended to show the impressive recovery of the town and its people in the lively print. Also, the earthquake destroyed the nine-ring (kurin) finial of the pagoda at Asakusa Kinryüzan Temple which shocked citizens. The finial was repaired within eight months, and two months later Hiroshige, as part of the series, published a print of the temple, commemorating the landmark’s recovery. Accordingly it is now thought that many places depicted in the series gained post-earthquake fame or a new attention, as symbols of Edo’s renewal. Since the prints could be mass-produced, the series may have functioned as a means to spread the good news to Edo’s residents. Putting the series into the context of the period’s political turmoil, the new interpretation also explains Hiroshige’s visual anomalies, such as exaggerated cherry blossoms. By the mid-19th century, the Tokugawa shogunate’s power was failing—Japan’s Confucian-based society and economy could no longer maintain political and economic stability and in 1853, the American Commodore Matthew Perry (1794-1858) arrived at the port of Uraga, forcing Japan to open its doors to foreign trade for the first time in centuries. The earthquake followed two years later, crippling the Tokugawa shogunate’s ability to maintain its authority, as social unrest rose dramatically. The Japanese thought that natural disasters such as the Ansei earthquake could be a sign of the coming of a new age, based on ancient Buddhist apocalyptic beliefs. The people of Edo might have considered the earthquake to be a sign of the shogunate’s impending downfall, preordained by the Confucian concept of the Mandate of Heaven. Hiroshige’s prominent cherry blossoms, which traditionally mark the start of spring and the new business year, might suggest hope for a new society. A careful reading of Hiroshige’s images in light of their historical context offers new insights not only into the artist’s creativity, but also into the society in which he lived. The Robert F. Lange Foundation has supported the Academy’s Japanese art programs for nearly two decades and made possible the conservation and preservation of thousands of rare woodblock prints from the James A. and Mari Michener Collection. It has also funded a state-of-the-art storage system, digitization of the prints, and the creation of an online database that will make the Academy's vast permanent collection available to the world. In recognition of the foundation's sponsorship of the Academy, the Japanese print gallery has been renamed the Robert F. Lange Foundation Gallery. We would like to take this opportunity to thank the Lange Foundation for its continuing promotion of international awareness and appreciation for Japanese culture through the Academy's collections of art.